The Office for Fair Access have recently published guidance and information surrounding the necessity of supporting Care Leavers into Higher Education. Read on to find out the latest statistics of looked-after young people who have progressed to HE and also what organisations are doing to support them once they are there. This briefing gives an overview of the current challenges around access, success and progression for care leavers and how, through their access agreements, universities and colleges are working to support students who have previously been in care. It also suggests questions that institutions might wish to consider when developing their work in this area. We hope this briefing will stimulate thinking and discussion about how care leavers and looked-after young people could be supported more effectively by universities and colleges, using evidence-led, focused approaches. How do we define care leavers? A care leaver is often defined by higher education providers as someone aged between 18 and 21 (or beyond if being helped with education or training) who, immediately before turning 18, was under the care of a Local Authority or a Health and Social Care Trust. We suggest using a wider definition – to include all those who have experienced care at any stage in their lives. This reflects the fact that there are profound differences in outcomes for people who have experience of being in care compared with those who do not. What do we know about the participation of care leavers in higher education? Statistics show that people who have experienced being in care have significantly worse outcomes across a wide range of measures compared to those who have not been in care. The graph below shows the very low proportion of care leavers entering higher education. In 2012 only 5.6 per cent of care leavers entered higher education, compared to 59.6 per cent of young people from the most advantaged areas and 20.4 per cent of young people from the most disadvantaged areas. In response to this worryingly low participation rate, OFFA is placing greater emphasis on supporting care leavers in our access agreement guidance. OFFA has also worked closely with the Higher Education Statistics Agency (HESA) to include a marker for institutions to identify care leavers in their statistical returns to enable more robust monitoring of sector performance in supporting care leavers. Source: Table F2, National tables FSR36/2013. 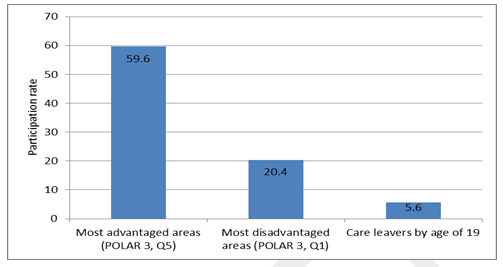 Note: The latest available data for care leaver participation covers the 2012-13 cohort. The latest available comparable analysis on the participation rate of young entrants from most advantaged and disadvantaged backgrounds covers the 2011-12 cohort (see HEFCE’s Trends in young participation in higher education report). It is important that care leavers have access to clear information. Their status as care-leavers should be handled carefully and with discretion. To access Government financial support or tailored support packages from institutions, students must disclose the fact that they have experience of care. However, not all young people want to disclose this information for a variety of reasons. Better information about the support available to care leavers and looked-after young people, disseminated to all potential students, may encourage care leavers to disclose their status and receive the support to which they are entitled. How are care leavers being supported? To find out more about how care leavers are being supported and some useful case studies, please click here.